Where did summer go? Our fair and 4-H projects are a distant memory. Labor Day has come and gone, the kids are back in school and we’ve scheduled the pool closing. I’m still catching-up with the veggie garden, savoring each and every sun-ripened tomato! I’m already anticipating a re-prioritization of my list of must-do chores (most of which got postponed due to the unusually HOT weather)! Have you noticed, the days are getting noticeably shorter too… and the leaves are falling! I can hardly believe the Mt. Bruce Station Sheep & Wool Festival is a few short weeks away. So much to do and so little time! I finally managed to make a few more felted soap… think of it as soap with a built-in scrubby wash cloth. Most folks purchase my felted soap as a novelty gift for friends and other fiber enthusiasts. A few actually use the soap…anxious for the soap to be used-up so they can re-purpose the wooly sack. Still others store their fragrant felted soap with their wool stash as a bug deterrent. Some say that it’s just too pretty to use! I like to use oval/round soap (as the corners may be difficult for the novice felt-maker). Wrap the soap with natural or colored wool roving neatly, alternating directions with every layer. Add just enough wool to cover the soap. 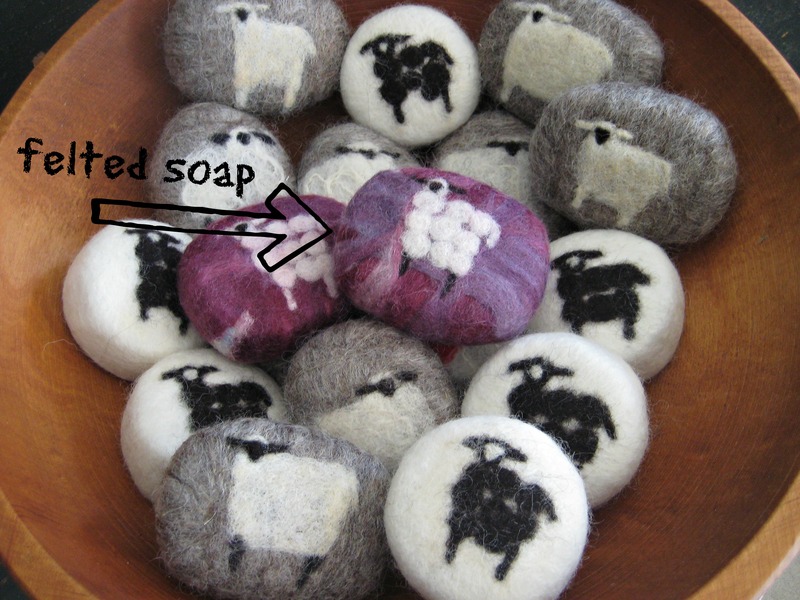 You may also needle felt an image/design onto the wooly soap (I do this before wet felting the soap). Then, alternate hot & cold water as you rub/agitate the soap in your hands to felt/shrink the wool. Viola! You have a wooly wash cloth with a built-in scrubbie! Towel blot the excess water and allow to air dry! So, here’s to a productive fiber’n weekend! This entry was posted in Farm, Projects, Sheep/Fiber and tagged felt, felted soap, felting, fiber art, needle felting, sheepy, wet felting, wool by Sheepy Hollow Farm. Bookmark the permalink.